A long sail down to Monamvasia was great fun, especially as Joel was full of energy and longing to try out every winch, block, cleat, line and wotnot that Simon had fitted for the voyage down. The spinnaker was hoisted with much cheering and laughter and we romped between the Spetses gap and Monamvasia at speeds not usually achieved on our own. It was great to hear Joel and Chris squealing with delight as a kindegarten of dolphins frolicked at the bows for several minutes. The first such visit since Malta. We arrived at the little harbour just as the sun was setting and a new condensation-rich autumn chill descended. For the first time since May we were forced to eat down below as the cockpit seats were so damp. 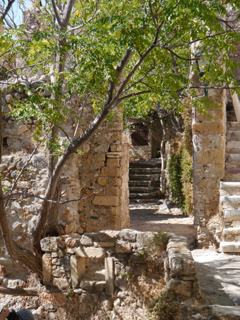 Monamvasia is a gem of a village which is reached via a causeway, thankfully no longer sporting a port cullis. There are no cars or even donkeys within its’ walls and the narrow streets are lined with beautifully restored houses, churches and tavernas. The history of this ‘mini Gibraltar’ is one of invasion and assault as various villains attempted to seize and occupy. The variety of architecture, from Byzantine to Venetian to Turkish now settles peacefully back on its cliffside haunches and makes a beautiful landmark. The following days saw us exploring little harbours and anchorages along the Peloponnese coast with virtually no other boats in sight. We revisited the tiny tuck in the hillsides where the name Rope Sole was conceived and swam in temperatures still exceeding 30*c. One harbour had a minature church on the South side where a wedding had just finished. We motored over to admire the bride only to find ourselves being included in the photos! The celebrations continued way past 2am as the singer’s voice rang clear across the bay. The early morning bread search also revealed carob trees and a deep groove down the mountainside where a river had once flowed. Fat shiny pomegranates have now replaced figs as the wayside fruit of temptation….which we ( mostly) resist. Plaka is one of out favourite destinations and we planned to spend couple of nights enjoying the village hospitality and pebbly beach. A forecast surge of wind flung Rope Sole into the harbour and we had just made ourselves secure when the gusts increased significantly. From a steady 20knts we were suddenly treated to 40knts which shook and trembled the boat like a cat with a sprat. Then, before we had time to zip the mainsail into the stackpack another gust ( 70knts this time) wrenched at the lines and thwacked everything in its path. From down below it sounded like a filthy tempered giant heaving a crate of cutlery against a wall. Thankfully that was the worst one and we zipped the sail away and tutted over the broken lazyjack block which had released a snake pit of lines all over the side deck. Ah, we knew how much Joel would enjoy being hoisted in the bosun’s chair to fix it! Of course that was the moment when a smart charter skipper demanded that all the boats, still reeling from the gusts, move along to make room for him. Another opportunity for international co-operation as everyone dashed about the quay and the wind continued to frustrate the heave ho…though, sadly, none of this was accomplished quite as speedily as our shouting friend expected. We finished the eventful day with a selection of the best dishes on offer atvour favourite taverna….having first been greeted like long lost family. Simon in particular received more hugs, backslaps, high fives and wet kisses than he’s enjoyed in a long time!